Thank you for your support and patronage of Sony products. 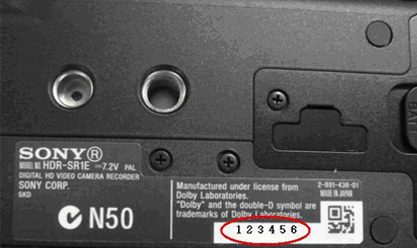 When replaying footage recorded with the camcorder in high definition mode, the stereophonic or surround sound effect may not be reproduced accurately. This symptom is caused by a problem with the software of the unit and the sound is not processed properly when it is recorded. As the recorded sound data itself is not missing, this symptom can be corrected with a software update for the camcorders. Please select your model and type in your serial number in the box below, and press Submit to determine if your product may be affected in Asia Pacific region. Click here to validate Serial No. 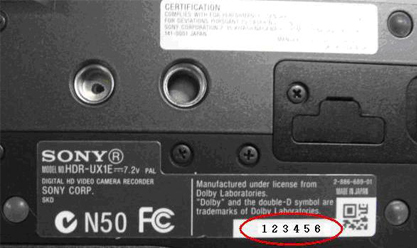 Please check the serial number on the label at the bottom of the camera. This service is provided on a free-of-charge basis by Sony. Recorded data can be recovered upon customers’ request. This service will be available in this region from November 22 onwards. Please contact your local service centre for the local availability. A list of Sony service centres can be found in the Service Centers page. Download Software Update from Website. Sony is preparing the program for the software update of the unit and data recovery. Details of this web service will be announced around early December. Please visit this website regularly for the latest updates. Thank you for your kind understanding and cooperation. Sony will view part of the content for recovery and confirm whether to proceed with the data recovery. Sony may refuse the recovery of the contents due to copyright protection etc. Sony is not liable for any recorded data that is missing or damaged during the recovery process. It is recommended that customers perform a back-up before the data recovery process.